We discuss a lot of wacky ideas in the CrunchGear chat room every single day. Most of the time, though, these ideas come to nothing and we just get on with being mildly informative. Not today! Presenting, um, a t-shirt we designed! It’s on CafePress, because that’s all we know how to use. We here know that the jailbreaking movement is alive and well, and that many of you are avid supporters of the whole movement… how else to install GV Mobile on your iPhone? 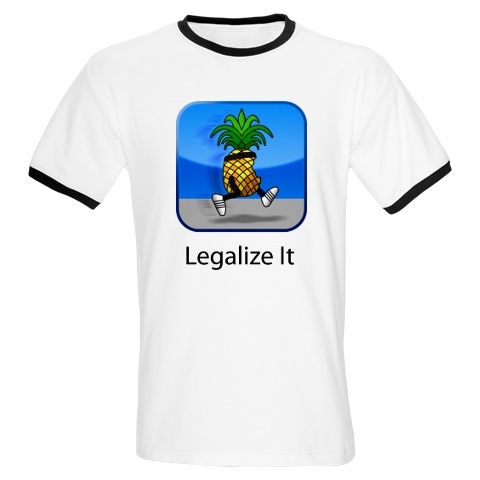 This shirt, featuring the famous “pineapple escaping” logo from one of those jailbreaking apps, is something we whipped up in the chat room last week. (There’s a lot of idle nonsense in the chat room, as you might expect.) And if this goes well, maybe we’ll look into putting some of our other ideas to paper or cotton or whatever.